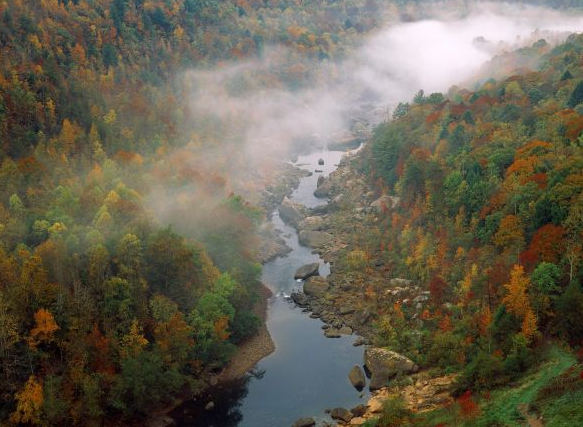 It’s little wonder the busiest time of year in the Big South Fork National River & Recreation Area is autumn. The Big South Fork is special in any season, but it’s this time of year — October and early November — when the national park really comes into its own. You might say that autumn is the BSF’s wheelhouse. When the northern Cumberland Plateau is decked out in the orange and red hues of fall, there are few places in Tennessee that are as spectacular. Even novice hikers can enjoy the best that autumn has to offer in the Big South Fork. From trails that are literally little more than a leisurely stroll through the woods — like the two-mile Angel Falls Trail, or the 1.5-mile Bandy Creek Loop Trail — to trails that take you into the heart of the BSF backcountry, there are a number of ways to experience fall up-close and personal here. Leaves are just beginning to turn in the Big South Fork. But over the next couple of weeks, the autumn season will begin to progress rapidly. By the third and fourth weeks of October, the fall foliage will likely be at its peak. With mild temperatures and plenty of dry, sunny days, this is an excellent time to get out and explore the trails. 1.) Middle Creek Loop Trail: Located on Divide Road on the western side of the Big South Fork, the Middle Creek Loop requires a bit of a drive from Oneida — about 30 minutes. But the scenery here more than makes up for it. Besides, a drive along the gravel, sometimes one-lane Divide Road is worth a trip in and of itself when the leaves are changing. The 3.5-mile loop is one of the most under-rated hiking trails — not just in the Big South Fork, but all of Tennessee, the Great Smoky Mountains not withstanding. The hike is mostly flat, with just 100 feet of elevation change spread over the three and a half miles. The trail is dotted with spectacular rock formations and meanders through a variety of hardwood forests. The hike begins and ends at the Middle Creek Trailhead on Divide Road, two miles off S.R. 154 in Pickett County. 2.) Grand Gap Loop Trail: When it comes to hiking trails in the Big South Fork, the Grand Gap Loop may be one of the most under-utilized of them all, especially among hiking trails in the Bandy Creek area. It was so under-utilized, in fact, that the National Park Service opened it to bike riders; hikers and mountain-bikers now share the trail. That isn’t a bad thing, as there’s enough trail — at 6.8 miles in total length — to go around. If the length seems daunting, don’t let it dissuade you from trying this trail for the first time. It’s an easy walk, with minimal elevation change. And the views are spectacular. The most notable of the views is without question the Angel Falls Overlook — which doesn’t actually provide a view of Angel Falls (trees along the river’s edge shroud the view), but does provide astounding views up and down the Big South Fork River. There are several other vantage points overlooking the river, but the main attraction of this trail during the fall months is the leisurely stroll through the hardwood forests. The hike begins and ends at an unsigned trailhead at the end of Alfred Smith Road, which is accessed by taking Duncan Hollow Road from the Bandy Creek Campground. 3.) Gentlemen’s Swimming Hole: At just over two miles in length, the trail to Gentlemen’s Swimming Hole and Meeting of the Waters just outside the Victorian village of Rugby is short enough to be hiked on a Sunday afternoon between church services with time to spare. The hike begins and ends at Rugby’s Laurel Dale Cemetery, where many of the town’s historical figures were laid to rest. It descends to the Clear Fork River, strolls by where White Oak Creek empties into the river, and climbs back to the top of the gorge again. Rugby is an enchanted place in the fall, and hikers will want to take a few minutes to stroll through town — perhaps even stopping for lunch at the Harrow Road Cafe. Be sure stop by the town’s visitors center on the way in to pick up a free illustrated trail guide. 4.) Oscar Blevins Farm: If you stand in the middle of Oscar Blevins’ farm north of Bandy Creek, it isn’t hard to imagine how peaceful life must have been here for the Blevins family. And it isn’t hard to see why Oscar Blevins resisted the federal government’s purchase of his farm to form the national park. It’s beautiful any time of the year, but especially during the fall. The hike in and out isn’t bad, either, following Bandy Creek for a while and passing by another old farm that has mostly been reforested by nature and time. The Oscar Blevins Farm Loop Trail is just 3.6 miles, beginning and ending at Bandy Creek Campground just past the NPS visitor center. The elevation change is slight, making this hike an easy one. 5.) Twin Arches Loop: The 6.0-mile Twin Arches Loop is the exception on this list — it isn’t especially easy. It isn’t especially difficult, either; it’s only rated as moderate, with 550 feet in elevation change. The most difficult part is the gradual climb back to the top of the gorge, and it’s well worth the effort to see the Twin Arches when the fall foliage is at its peak, along with the other sights that wait to be photographed along the trail. Beyond the Twin Arches, the trail drops into the gorge, visiting the Charit Creek Hostel before eventually climbing to the top of the gorge again. Charit Creek is itself a spectacular sight in the fall, with the cliffs standing sentry over the valley as the autumn colors and brilliant blue skies provide a picturesque backdrop. Hikers can purchase snacks at Charit Creek, or even reserve lunch or supper in advance. The hike begins and ends at the Twin Arches Trailhead off Divide Road. Since Big South Fork Airpark‘s creation in 2007, we have made it a pirority to invest our time and resources into the local community. We do not just work here, but live here as well. Big South Fork Aipark has partnered with the state governor to increase the quality of life for our community, encourage recreation, stimulate tourism and retirement industries, which have all been deemed critical to the local community. We have had the pleasure to host events, volunteer and support some of the leading organizations in Scott Country, including but not limited to the Boys and Girls Club, CASA (Court Appointed Special Advocates for Children) and the grant to preserve the historic O and W Bridge. If you are interested in volunteering or getting more information please contact us.